Updated August 2018. Much has changed in 3 years since the original post. This is now more like a snapshot in time than an up to date restaurant review. While Pender Island, British Columbia is not necessarily an easy cycling destination, many brave souls pedal the scenic hilly winding roads with no bike lanes populated by bounding deer and questionable drivers, some of whom think a center line means you center your car on it. Many of us “locals” prefer to take our bikes on the ferry and cycle the flat rail trails of the Saanich peninsula (see http://wp.me/p4pOXg-Y). If you do cycle Pender Island, perhaps tackling The Tour de Pender as described in the Pender Islands Handbook, where does one stop to eat? 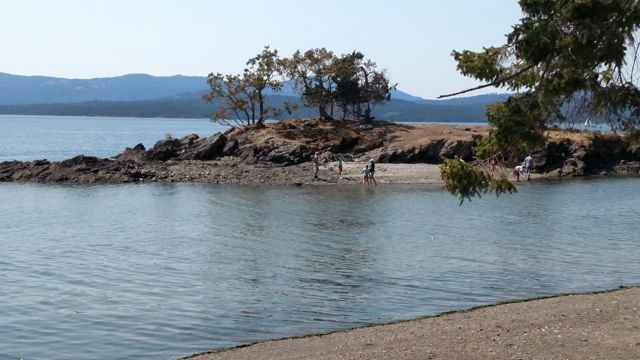 Scenery like this makes Pender Island magical. I spent two wonderful weeks exploring my beloved haunt in August 2015. While far and away our best meals were the home cooked masterpieces of friends, including lots of freshly caught pink salmon, Steve and I also sampled most of the restaurants, and I now present my unbiased amateur food critic’s review based solely on our drop-in experiences, with some comments from locals thrown in where appropriate. Most places are open for other meals besides the ones that we sampled. Many local restaurants proudly use local produce whenever possible. What surprised me was that only Hope Bay Café and its Café at Large food truck, Pender Sushi, and Tru Value’s coffee stand serve the fabulous local Moonbeans coffee, some of the best we’ve ever had. The new owners of Poets Cove Resort dumped the long-standing contract with Moonbeans in favour of Starbucks. Others have their reasons; perhaps price being one of them to not “buy local” in this instance. Hope Bay Café and Pender Sushi have closed. The charming Hope Bay Café closed, replaced with Philly’s Cafe that also closed. A new spot just opened and is not reviewed. This space has awesome water views to the east. Great presentation but not much meat on the bones. Hope Bay’s rib night, now a piece of Pender history. Port Browning Pub is now Bridgemans Pub and Bistro. 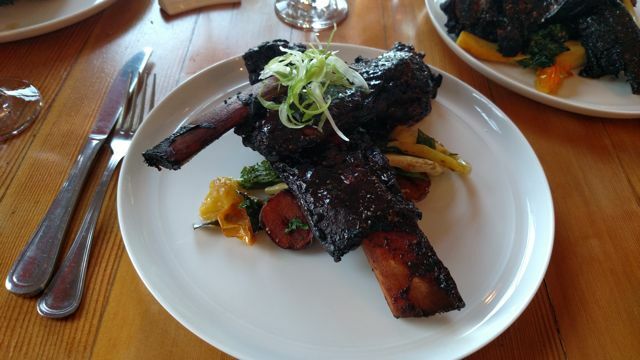 This review now relegated to Pender history as well since they have made a lot of changes: When it comes to ribs, Port Browning Pub’s “2 for $25” Saturday rib night is still a great value. 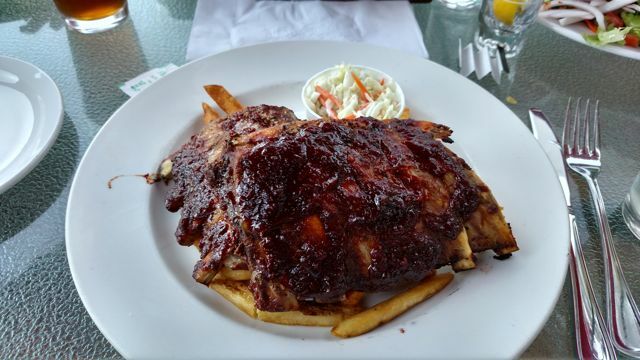 They serve a Flintstones size portion of delicious meaty pork ribs with fries (sub a salad for $1) and coleslaw. We also went for Turkey Tuesday, once the popular bounteous bargain, where heaps of yummy turkey and fixin’s for $8 drew huge crowds. Now at $15 for a much smaller portion, the rush has subsided, although it did taste good. Steve had a salad with chicken added for $16.50, which is way overpriced. So Browning is not necessarily the inexpensive everyday restaurant it once was except for some of its specials, and perhaps breakfast, burgers, or pasta, such as the butternut squash ravioli ($13), given a thumbs-up by a friend. I love the ocean views from Browning, and it seems to be much cleaner than in the past, but as an avid water drinker I despise the taste of their well water. Even though I ordered a club soda it was made with the same water. I recommend beverages out of a bottle here, or BYO water! Generous portion of delicious ribs, Port Browning’s rib night. The Inn on Pender and Memories restaurant finally sold in spring 2015 and is now the much hipper Woods on Pender with its Airstream trailer accommodations and Coffee+Kitchen restaurant. Several friends had gone when they first opened and did not wish to return, but we wanted to try it ourselves as businesses can improve after first opening, and they have. We went for brunch on Sunday when their breakfast menu is extended to early afternoon. 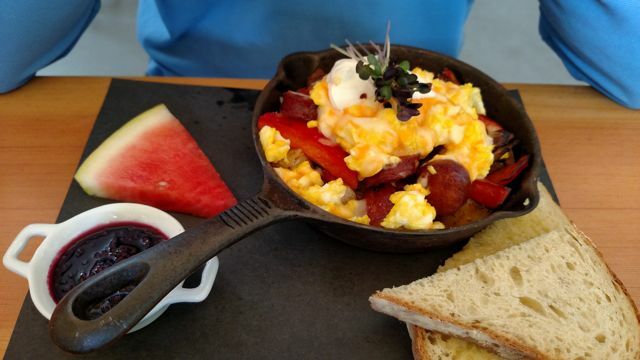 The skillet dish for $11 was very good, a tasty combo of eggs, potatoes and choice of meat or vegetarian. It comes with toast with homemade jam or Nutella. The $12 waffle special of the day contained eggs and bacon atop a fairly dry waffle that was OK, but not something I’d get again. We saw banana bread French toast go by that looked ultra thick and awesome, a must to try next time. All in all it was a very pleasant and satisfying experience in a relaxed atmosphere. If you’re there for intimate conversation however, the long family style tables may not be what you’re looking for although they do have a few smaller tables. Our only complaint was the coffee. For decaf drinkers like us the only option was a $3 no refill Americano. I liked the coffee but Steve hated it. Time to get local Moonbeans’ coffee, especially their Swiss-water decaf! Others have said lunch is good here, and that dinner is good but pricy for what you get. We didn’t make it to those meals ourselves, so more non-biased recent opinions are welcome. This is an innovative new Pender business that I’d like to see do well. The Pender Island Bakery (now Vanilla Leaf Bakery) has been in Driftwood Center forever, but we had never tried their burger bar. I ordered a turkey burger for $9 with a small potato salad, while Steve paid the same for the “large” plate of their salad bar. Luckily Steve ate really slowly, since the burger took a long time on the grill. Although expensive with not much variety, Steve complimented the taste of every salad bar item. When my bbq’d burger finally arrived, it was excellent, especially with all the build-your-own ingredients including chipotle mayo, tomato, pickles, etc. I’d definitely get that again. The selection of pre-made panini’s, my former stand-by for a quick hot lunch, was not that great when I looked, perhaps it was late in the lunch hour at 1:30. When selecting goodies from the bakery I typically request the most recently baked, but I forgot to this time, and our cappuccino gluten free brownie tasted good but seemed like it was a day or two old. Unfortunately local Moonbeans coffee is not served here. Slow Coast Coffee in the Magic Lake center with nice views of the Medicine Beach waterfront makes its own flour for its baked goods. We tried to go once to sample its crepes based on friends’ recommendations, but the party in front of us was told they’d have to wait 30 minutes for theirs, so it would’ve been an hour for ours? No thanks. We went back again on a less crowded day when there was no wait. My feta and sundried tomato crepe was delicious, though a bit sparse; I would order a third optional ingredient next time. 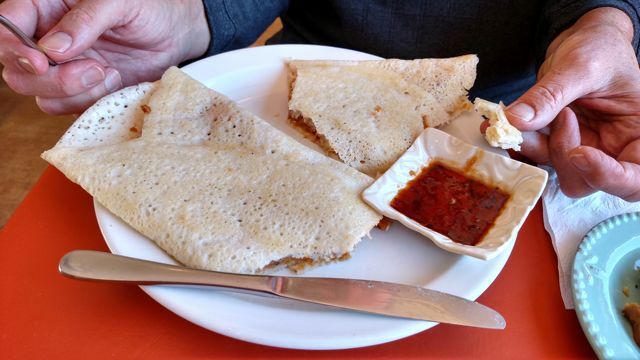 Steve raved about his East Indian chickpea dosa (gluten free crepe-like rice flour pancake) ($8). We also sampled two kinds of gluten free cookies and they were fresh and fantastic. Slow Coast also surprisingly does not offer Moonbeans, roasted just up the road. Cash only. Gluten free chick pea dosa crepe at Slow Coast Cafe. The Café at Large, a food truck affiliated with Hope Bay Café is a new highly touted establishment that hangs out a couple days a week at the new exciting Sea Star Vineyards, which is doing well, congratulations to them. The food truck is now at Southridge Farms. We unfortunately didn’t have a great experience a few years ago, but I’m sure that was just an off time…. Perhaps a case of ordering the wrong thing at the wrong time, we were a bit disappointed with our experience compared to our high expectations. They were slammed on Wednesday when there is a small outdoor market present, and we had a long wait for our food, although by the time it was ready a precious table had opened up. Out of four, two of us got the beef burgers ($11), which were fairly dry and OK, albeit healthier and less greasy than a typical burger. The vegetarian in the group complimented his cauliflower burger. Steve had the eggplant tacos ($7). His first bite was cod, so luckily he’s not vegan. He said it tasted very good, though the portion was small with just one taco, not a meal on its own, so hearty eaters would need at least two. We also got the fries with gravy ($5), which were fine. For two of us with two small bottles of water (no tap water offered) our burger, taco and fries came to $31. Does that mean they charged $3 each for those tiny bottles of water? We hope they do well and plan to give the café another try someday, perhaps ordering their grilled cheese ($7) and tomato soup recommended by friends. Pender Sushi is always a delight but is gone. We like their new location at the golf course, scenic deck over the first hole, and always-pleasant service. 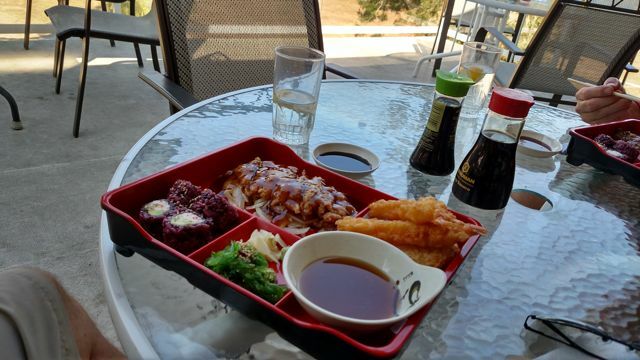 Their $12 (including tax) bento box is delicious, filling, and a good value. I’ve also enjoyed their salmon teriyaki in the past, but had been having a lot of salmon while on island this visit. They weren’t offering our favorite, the Korean bibimbap bowl, more of a winter thing now we were told. I can’t comment on their actual sushi, but others swear by it. The only negative is that it took us about 30 minutes to get our food on each of our two visits, so go for conversation and relaxation rather than a quick bite. The Bento Box at Pender Sushi. Finally, we have always liked the food at The Stand at the ferry terminal. Now under new ownership, prices continue to creep up, as have food prices in general, so like most places it’s not the bargain it once was. Their once famous beef burgers are $7 – $10 and fries are $3 extra. Steve had the deluxe burger, and based on his memory of their fabulous burgers of the past, he was disappointed with the meat patty that he thought had filler. I had the lamb burger ($12), and it was OK, but I won’t order it again. We also got fries, which were fine. Granted, our taste buds were distracted by orcas going by, which ended up following the Queen of Nanaimo halfway across the Georgia Strait! We’ll continue to patronize The Stand, perhaps next time re-visiting the chicken burger we used to love, and of course their AM breakfast sandwiches. We did not make it down to Poets Cove Resort on South Pender this time. We used to go to Syrens bistro and its scenic patio as a fun destination when we had our boat, or to combine with a walk at Brooks Point or Greenburn Lake. Aurora’s former $20 Sunday buffet brunch was exquisite and a decent value including omelet bar, and served with carafes of local Moonbeans. Alas, under new ownership, gone is the brunch buffet, and the Moonbeans, substituted with a daily $17 hotel style basic breakfast buffet. The former upscale Aurora restaurant is only open to private parties for lunch and dinner. Prices at Syrens keep going up for its pub fare, and we did not hear good reviews from locals, but did not try it for ourselves so can’t comment on the food. We did make it to Syrens in 2017. The bacon fries were awesome. We also did not get a chance to sample food items that may be offered at the Islands’ stores/markets (Tru Value, Southridge Farms, Pender Market, Otter Bay Marina). Offerings may be seasonal, so call before your ride. Jo’s Place opened at Driftwood Centre after this post was published. We’ve had many good meals there, real home cookin.’ I love their skillet breakfasts. All in all, there is still great food available on Pender Island, at what I’d call “resort prices” compared to the mainland. But then Pender restaurants have to take a seasonal market, high ferry fares and other expenses into account when setting their prices. I welcome others’ non-biased opinions of their recent experiences! 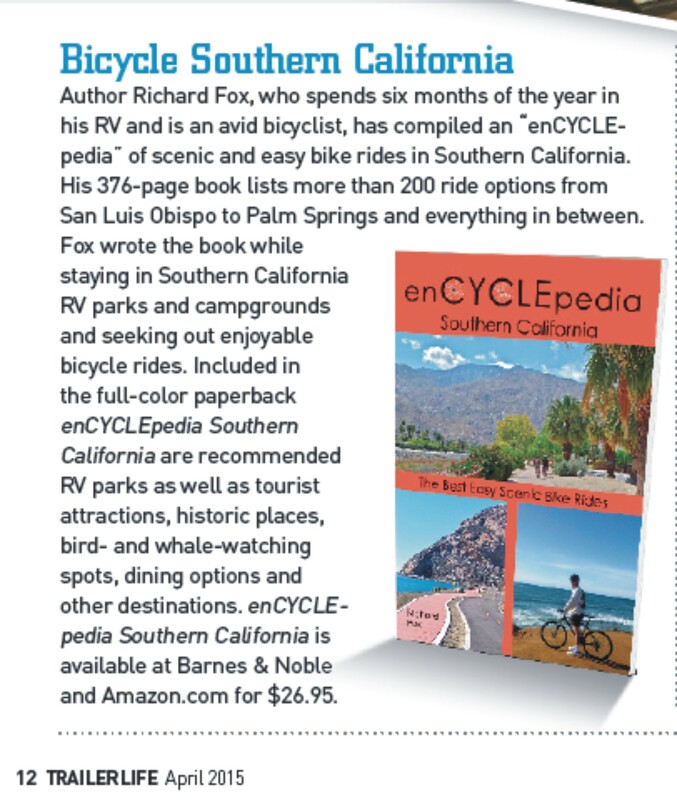 enCYCLEpedia and author Richard Fox were featured in a very nice OC Register article featuring the best rides of Orange County and the enCYCLEpedia rides in general. 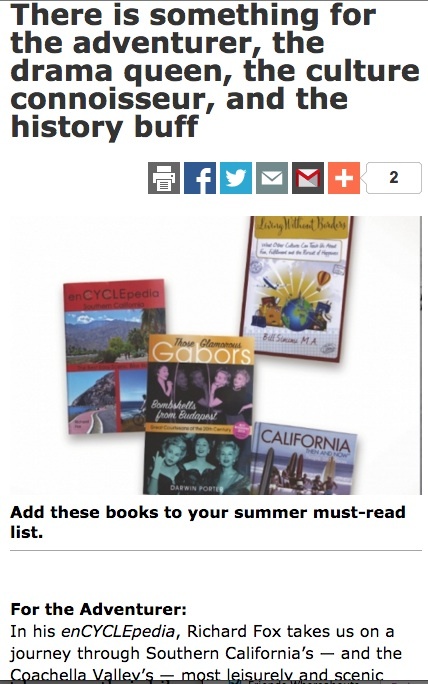 Click for web version of article. 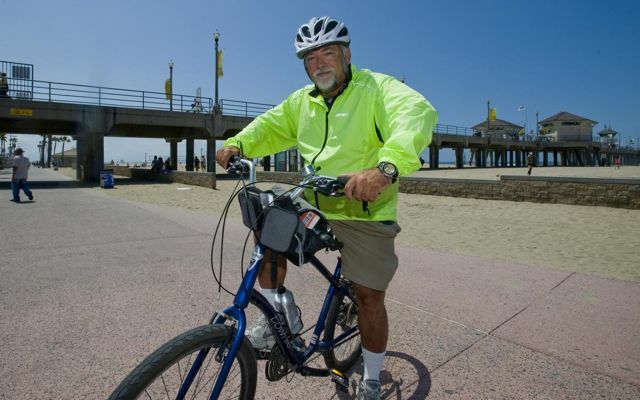 Richard Fox on the bike trail running along the ocean in Huntington Beach, his favorite Orange County ride.